The most preferred and well-known hotel at New Digha, for its homely ambient and comfortable accommodation. 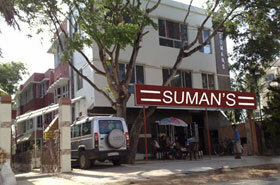 Hotel Suman's is always ready to welcome customers with an efficient team of cordial boys and provides all modern facilities to the boarders at very reasonable tariff. Playground for Children Intercom/R.A.S. * *All rates indicated are off-seasonal and may rise during season period. All rates in INR. This site requires Adobe Flash Player plugin. Copyright Hotel Suman's, 1986. All rights reserved.